Pay Down Your Mortgage or Save? We are living in strange times. Western world central bankers are creating an economy based off debt, which is scary because consumers have demonstrated in decades past a general lack of fiscal responsibility when credit is cheap. What’s more, some countries in the Western world, specifically in Europe, are now under negative interest rate environments – Canada and the United States are dangerously close to doing the same. For average Joe, this means he has to pay the bank to deposit money. In other words, central banks have enticed homeowners and consumers to spend as opposed to save. This dramatically impacts real estate investors and landlords alike as it can prop up housing prices without wages increasing. This creates more risk in the housing market because the income-to-mortgage ratio increases nationwide. Although it can create a great market to speculate in over the short-term, the long-term ramifications concern me – specifically if inflation hits the economy and central banks are forced to raise rates. 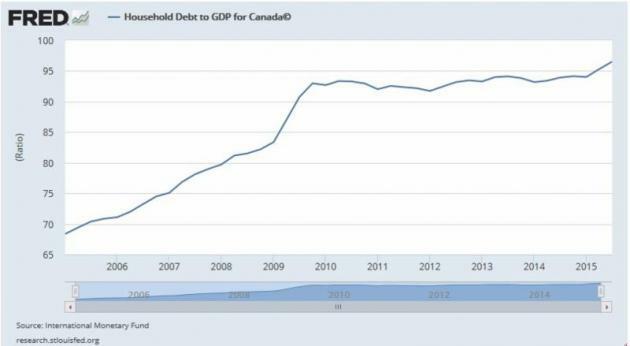 Households are taking on boatloads of debt – historic amounts, in fact. Firstly, most housing markets are currently frothy. They’ve been on a six to seven year run. And in cities such as Vancouver, Hong Kong, London, New York and San Francisco, they’ve been running for more than a decade. Who wants to chase a pump? Not me. So if you’re in a hot housing market, and credit is cheap, don’t take on more leverage just so you can add another property to your portfolio. That’s an ego play. Course, I understand the benefit of having rental properties that carry large balances – you can write off the interest paid on the property. That’s good, but only to an extent. Here’s the benefit to paying down your investment properties: it improves your credit (making it easier to get mortgages in tough times so you can buy properties on the cheap) and adds to your net worth. In a down market, if you want to take a swing at a big investment project, and you need the bank’s support to do it, it’s helpful to show a track record of prudent credit management and, most importantly, an asset you can use as collateral (such as a paid off investment property). The argument against this is ‘why would you pay down the balance when the loan is basically free?’ You’re doing it to prepare for the next down market when liquidity and credit are tight and you want to make a quick play on an asset that in the current market is just too expensive. And when you pay down a mortgage you can get an interest only revolving credit line attached to it (up to 80% of the loan to value), which may allow you to acquire another investment property when builders are desperate for cash offers. A cash offer in a bear market makes you a king. Liquidity matters in tough times. Although I don’t expect interest rates to rise significantly for a long, long time, I am expecting a credit tightening period in the near future. Given the state of our current credit based economy, that on its own will slow the housing market substantially. As a landlord, don’t look to acquire properties now if you are in a hot housing market… look to pay down balances and establish credit facilities. Be ready for the next correction.